Two textbooks were listed as required for the “Justification in the Pauline Corpus” classes I am currently taking. They are not easily located and finally I had to fork out RM108 to get Westerholm’s book from Canaanland that had them flown in. I started reading it before classes and before long found myself more scanning than reading. I just got hold of Piper’s book yesterday (also from Canaanland), and read about 40 pages of it this morning. It is a good book. 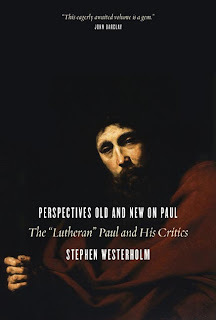 For someone who has not spent much on this topic of justification and who is quite new to the New Perspective on Paul (NPP), I feel that Piper would be a good start. The Gospel is not about how to get saved? Justification is not how you become a Christian? Justification is not the Gospel? We are not justified by believing in justification? The imputation of God’s righteousness makes no sense at all? Future justification is on the basis of the complete life lived? First-century Judaism had nothing of the alleged self-righteous and boastful legalism? God’s righteousness is the same as His covenant faithfulness? To me, at this point at least, the Gospel is about how we get saved, justification by faith is how I become a Christian, but that is about all I can attest to in the list above for now. I do not agree that justification is the Gospel per se, or that we are justified by believing in justification. I would have to read Piper to see why he asked those questions. I do not have an answer to the question on imputation because as much as I believe that Christ’s righteousness is imputed on us, I need to study it deeper. As far as the other questions are concerned, I have no idea what they refer to. I will have to read on to find out. And just like the last book I actually finished reading, I must do the same for this one and kick myself if I end up having it half read like the ones piled on top of my table now. Hit me if I do. I love the title Pearlie! I hope you follow-up with more on the Piper book. About the book, I hope I can keep up - I am halfway through and in the verge of browsing already because being so ungrounded in the traditional view, it is hard to understand traditional from new or new from traditional for that matter. MBS won't allow you to transfer? Why not? What are you doing there btw? I am not taking Isa either - too many pending and Thurs night is school night. When will be meet I wonder ... you with MBS, I with STM, another CBTE one?